Preparing for the bonanza of a new nuclear build that never came emerged as a key reason for the financial ruptures at the South African Nuclear Energy Corporation Ltd (Necsa), Parliament’s energy committee heard on Tuesday. The impact of the push of former president Jacob Zuma’s administration for nuclear power was highlighted when the Necsa board and officials briefed MPs on its annual report – tabled months after the statutory September deadline in 2018, with 12 disclaimers and doubts over its status as a going concern. The Jacob Zuma administration, and going big on nuclear with an extra 9,6 GigaWatts, are inextricably linked since his second term after the 2014 elections. And the opposition of National Treasury to the nuclear deal, widely costed at R1-trillion, is at the heart of the politics of State Capture, including the sacking of finance minister Nhlanhla Nene in December 2015 when he refused to endorse a nuclear deal with Russia. As recently as 18 February 2019 the Zondo Commission of Inquiry into State Capture heard about the behind-the-scenes machinations when former National Treasury director-general Lungisa Fuzile confirmed earlier testimony from two former finance ministers he had worked with – Nene, and Pravin Gordhan, who today is public enterprises minister. At one meeting called to discuss the nuclear deal, Fuzile testified as to how Gordhan insisted that “every rule in the book” would have to be followed if the country were to proceed with a nuclear deal. The closest South Africa came to stepping up nuclear beyond the Koeberg power plant was R200-million allocated for “preparatory work” in the October 2015 Medium-Term Budget Policy Statement. In late April 2017 Earthlife Africa and the Southern African Faith Communities’ Environmental Institute effectively stopped the nuclear deal in its tracks when the Western Cape High Court ruled invalid and overturned the inter-governmental agreements South Africa had signed with Russia, South Korea, the United States, France and China. The government never renegotiated these inter-governmental agreements, the first step in a fully negotiated and concluded deal, for public tabling and approval in Parliament as is constitutionally required under Section 231. 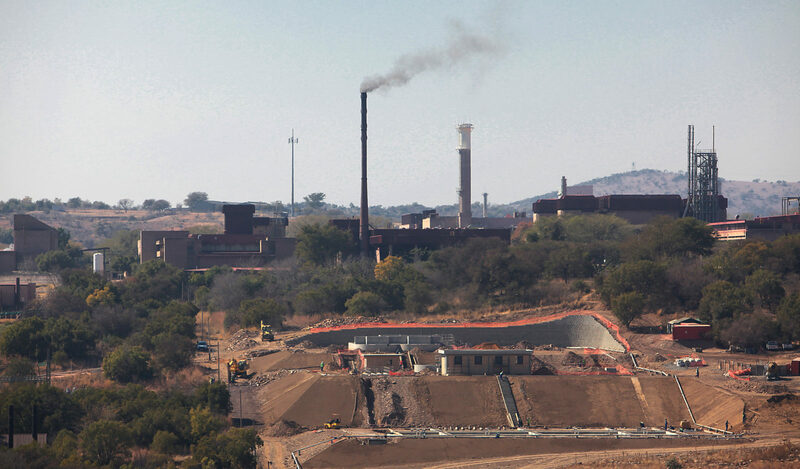 But for Necsa – the State-owned Entity responsible for nuclear research and development, but also processing nuclear and restricted materials for, for example, medical isotopes – the political and other machinations around South Africa have extracted a huge cost. It lost R62.6-million in 2018, after a R79.7-million loss in 2017. And that’s not counting the losses at its subsidiaries like fluoro-chemical product manufacturer Pelchem (R35.5-million) and Pelindaba Enterprises (R77.9-million). On Tuesday, Necsa board chairperson Rob Adams told MPs that hard decisions needed to be taken to deal with this “crisis” amid sustained losses, to ensure the return to viable going concern status. “For the better part of a decade and a half, there has been talk of a new nuclear build. Necsa has been requested to retain nuclear capacity… Yet this new nuclear build never materialised,” said Adams, adding later that while Necsa was told not to rely on the fiscus, but find commercially viable partners, there came a point when the commercial viability of such entities had to be questioned. For example, Pelindaba Enterprises “geared up for the new nuclear build” with the internationally required nuclear stamp to manufacture a range of nuclear products. As part of this process, it re-organised its plants, replacing the non-nuclear sections with a focus on nuclear. And manufacturing a tractor to nuclear standards meant it was simply too expensive and could not be sold. Adam heads a newly appointed board approved by Cabinet on 5 December 2018, after Energy Minister Jeff Radebe sacked the previous board and suspended the CEO, arguing insubordination, failure of legislative compliance and various irregularities. Ex-board chairperson Kelvin Kemm, former audit and compliance board member Pamela Bosman and the suspended CEO Phumzile Tshelane are challenging their removals as unfair and unprocedural in a court case set down for early June 2019. This is making things tricky for Adams and his team, who have finalised the annual report, including the financial statements, earlier in 2019, months after the statutory September deadline. This was done through a series of management letters, MPs heard, and by stopping fighting with the auditor-general’s audit opinion, the second worst possible. There is a silver lining. NTP Radioisotopes, a global supplier of nuclear medicine and radiation products as part of the Necsa group, is making money: R108-million in 2018, albeit down from R168.9-million in 2017. And there’s confidence that NTP would recover as it was described as a “healthy” entity with a good market share. But elsewhere, tough decisions must be taken with regards to the shape and size of Necsa, the group, with its subsidiary. For example, does chemicals company Pelchem really belong with the Energy Department, where it is now only because one chemical it produces is linked to nuclear? One definite is slashing Necsa’s salary bill of roughly R800-million, well above the R530-million grant the SOE gets from the government. “I don’t want to be accused of declaring a Section 189 (retrenchment notice) in Parliament, which I was not doing,” Adam added quickly. The board has planned strategic meetings over the next month to finalise decisions. The salary bill debacle is an echo of what’s unfolded at Eskom. Salaries at the power utility ballooned to R29.5-billion in 2018, up from R9.5-billion in 2007, and middle management expanded from 80 to 600. But touching workers’ income is sensitive, particularly in an election year, as shown by President Cyril Ramaphosa in his State of the Nation Address (SONA) announcement of Eskom’s unbundling into three entities. Unions loudly voiced their opposition to Eskom’s unbundling, saying this was tantamount to cutting jobs and the initial steps for ultimate privatisation, forcing Ramaphosa to categorically state that unbundling did not mean job cuts. At this stage, it is unclear how the Necsa board intents not only to cut the salary bill, but also turn the SOE’s fortunes around. The board has been given a two-month extension to submit its strategic plan by April 2019. The reality is that there will be no new nuclear build. In July 2018, on the sidelines of the BRICS Summit, Ramaphosa told Russian President Vladimir Putin there would be no nuclear deal as South Africa could not afford it, as it was widely reported. Feathers were ruffled and smoothed back into place, for now, by all accounts. But for Necsa, the hangover of the second Zuma administration’s nuclear push must now be dealt with. “We have to address the massive salary issue. Without that, there isn’t any sustainability,” said Adam.